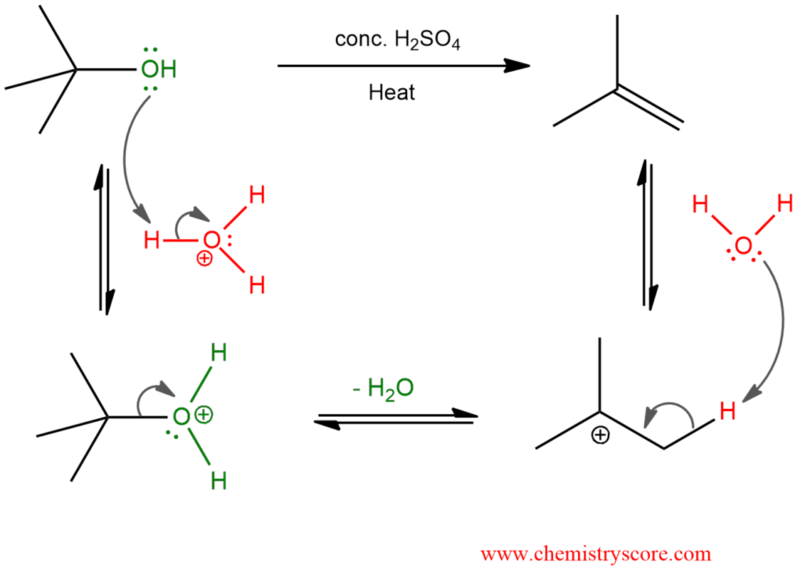 Addition of acid to alcohols can result in elimination to form the corresponding alkene along with a molecule of water. Because water is eliminated, this process can also be called dehydration. If the substrate is an alcohol, the OH group must be protonated to give a good leaving group. And for this purpose, a strong acid (concentrated aqueous sulfuric acid) is used. Dehydrohalogenation of alkyl halides can form a mixture of alkenes. When it occurs, one of the products usually predominates. According to Zaitsev rule, the major product in β elimination has the more substituted double bond. This is the more stable product. First, β positions that have protons are determined. It is each carbon atom (with protons) in the adjacent of the carbon atom to which OH group is attached. And then consider all the possible products from which the most stable form (more substituted double bond) will be the major product while the others are minor. The E1 process is regioselective because it exhibits a preference for the Zaitsev product. A reaction is regioselective when it yields predominantly or exclusively one constitutional isomer when more than one is possible. And it is also stereoselective because when cis and trans products are possible, we generally observed a preference for formation of the trans stereoisomer. A reaction is stereoselective when it forms predominantly or exclusively one stereoisomer when two or more are possible.